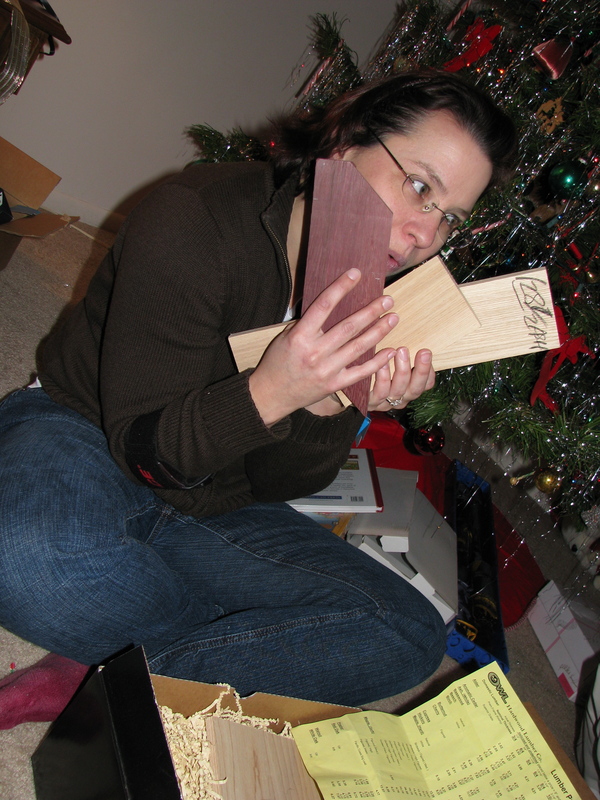 Hardwood and supplies for Christmas! Yes, it’s true. I got a bunch of wood-type stuff for the holidays. My husband picked up some of my more standard supplies. 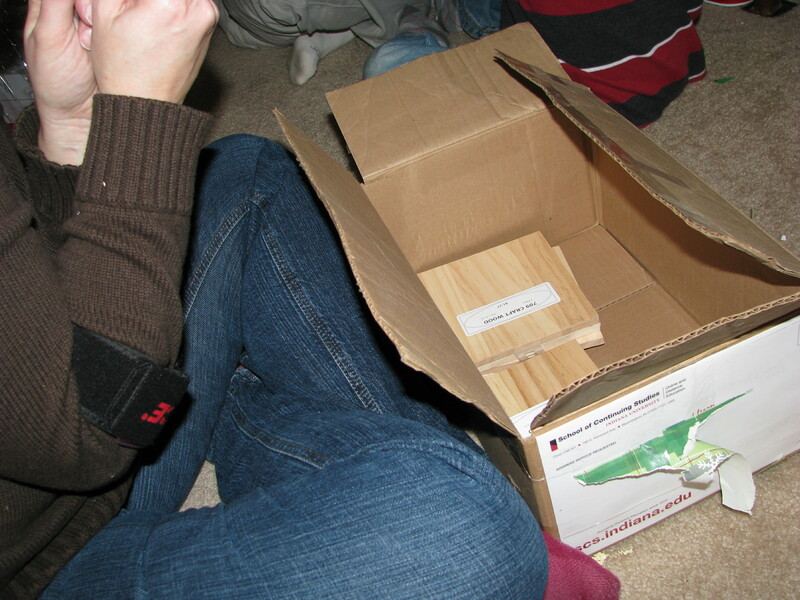 And, my brother was kind enough to get me some new hardwoods — some of which I’ve never even heard of before. 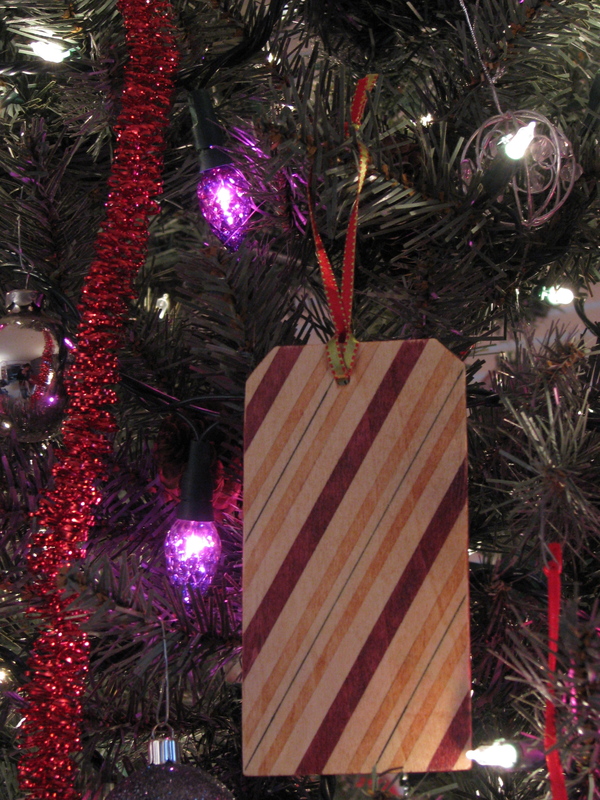 Including panga panga, jatoba, purpleheart wood and one of my more normal favorites, maple. I can’t wait to see how the stains look on the new wood! I think my socks match the purpleheart wood! It’s the best time of the year… At least that’s what I’ve heard. 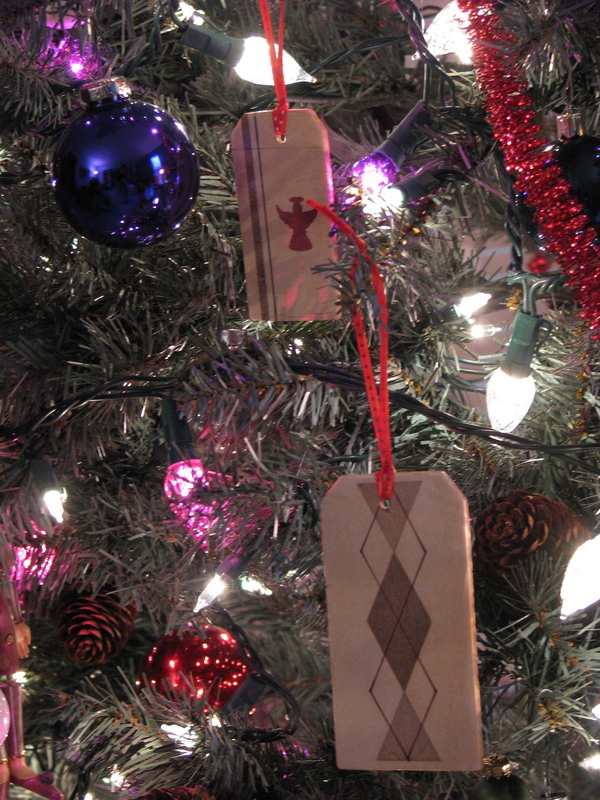 My ornaments and I will be making a second attempt to visit friends and family today. We had to turn back after freezing rain made the roads gridlocked. It’s amazing how much relief my husband and I felt just getting out of traffic and turning back. We’d just barely made it to 37N in the 45 minutes we’d been travelling — and if you’re familiar with Bloomington, you know that’s usually a 5 minute trip. Here’s a tiny pic I snapped after we turned around. Not the greatest, but you get the idea. We’ll try to leave again, soon. Wishing everyone the best of luck this season! Yes, it’s true. I’ve managed to finish some ornaments over a week before Christmas. I’m not sure how, but I do know that I haven’t baked anything, yet. So, here’s what they look like after several coats of high gloss tung oil finish. I had to put away my trivets for a little bit. I realized that my next idea was on a time crunch. Ornaments!! I found some little tag-shaped craft wood. (Yes, I spend a decent amount of time at Michael’s.) 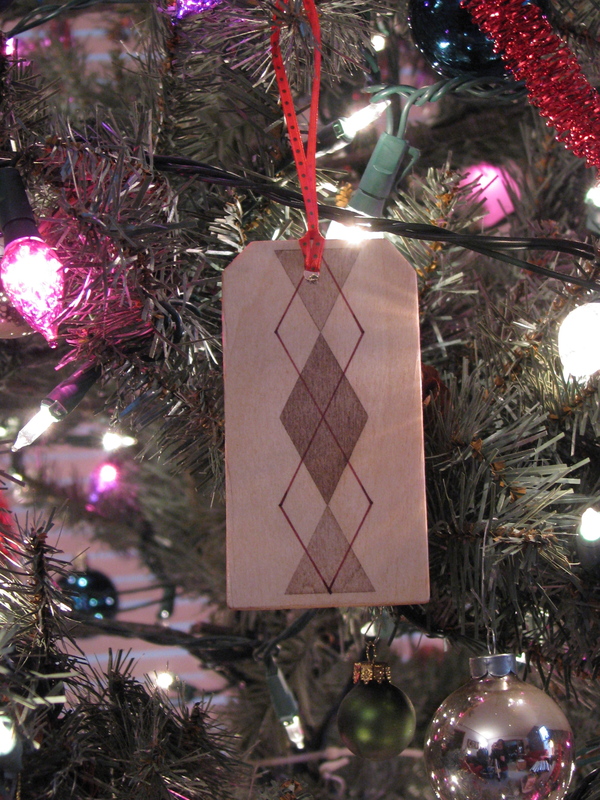 A few round ones, and am turning them into stained wood ornaments. So far, I like them, and think they have great potential. This seems like a natural holiday project. Perhaps an annual one? Maybe I should just give them as gifts? I guess I should get back to work. Only a few are out of the stain phase. Tick, tock! I’m not sure why I’ve decided to work on a bunch of different trivets at one time, but that’s what I seem to be doing. New designs and new sizes. More complex than ever before. It’s exhausting. 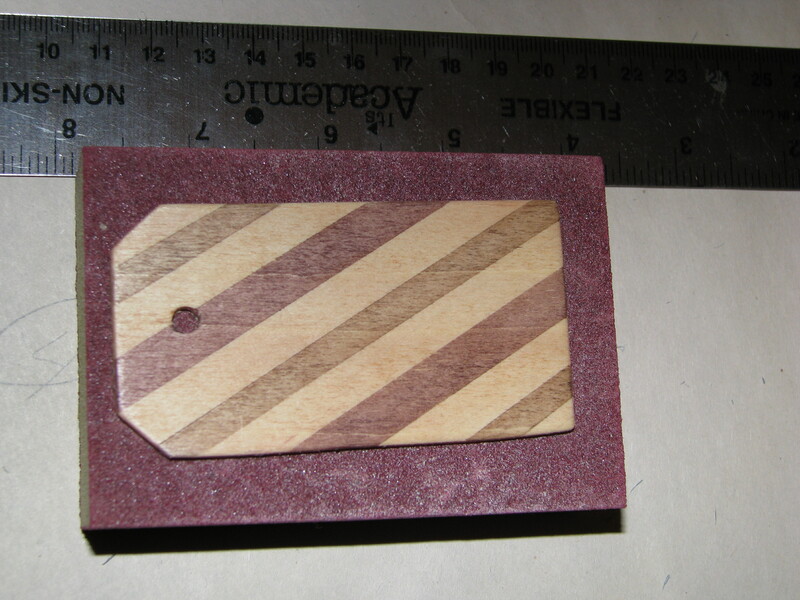 In the past the trivets have been 9 1/2″ squares of pine that I stain and finish with polyurethane. Many, many coats of polyurethane. It works great. I’ve been known to take things straight out of the oven and onto the trivet without any problems. Now, I’m trying out some 6″ squares. I think they will work out nicely. I’m working on several different pieces right now, including a better version of the DC Star — both large and small. That’s actually the smaller DC star, and a comparison of the two sizes with another pattern. I guess I should look up what that one is called, huh? Any ideas? 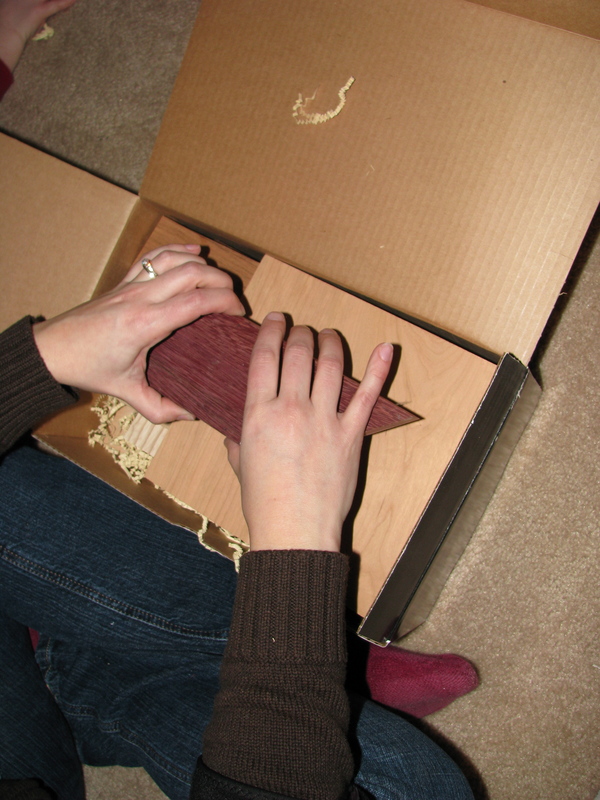 You are currently browsing the Stained Woods: Art by Tina Hanagan, Bloomington, IN weblog archives for December 2008.